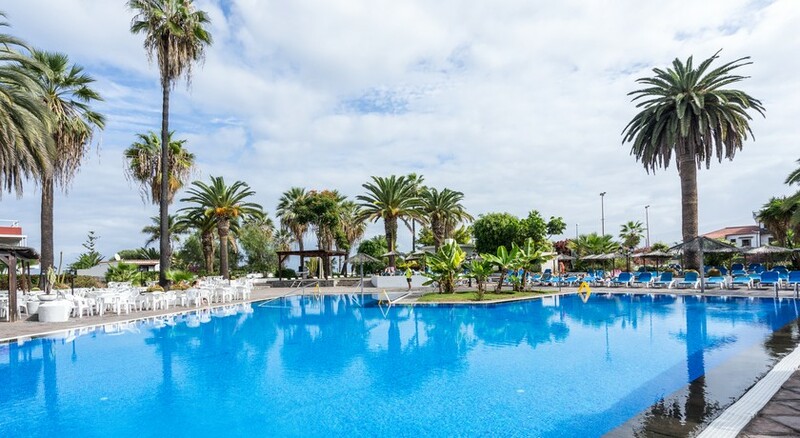 Hotel Blue Sea Interpalace is located in Puerto de la Cruz in a quiet residential area, close to the beach and the natural pools of Lake Martianez. Its subtropical gardens are often considered to be a paradise of peace and tranquillity. The hotel has 225 well-furnished rooms with balcony or terrace. 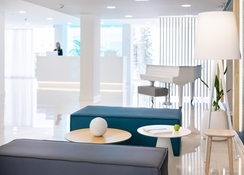 Other hotel facilities include a buffet restaurant with terrace, a lobby bar offering panoramic views, a lounge bar with disco and live music and a snack bar in the pool area. The hotel also offers entertainment programs and shows as entertainment for its guests. 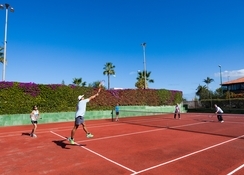 Perfect for a holiday stay, the accommodation has an outdoor pool and allows you to practice sports such as shooting, gymnastics and aerobics. The hotel creates perfect laid-back ambience with garden furniture around the pool. 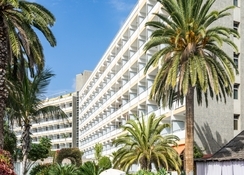 Hotel Blue Sea Interpalace is located in a garden area in Puerto de Santa Cruz in northern Tenerife. Only 25km from the island's airport, in its surroundings there are several restaurants, bars and casinos. You can visit the Loro Parque – 15-minute drive, or the Teide National Park – an hour’s drive from the hotel. The hotel offers 225 well-appointed guestrooms. The rooms are spacious and brightly lit and are equipped with air conditioning, television, telephone, minibar, bathroom with hairdryer and a terrace or balcony with furniture. Guests can choose between Double rooms, Double rooms with single occupancy and Single Parent rooms. Hotel Blue Sea Interpalace organises themed dinners, show cooking and international buffets every week. The hotel hosts a buffet restaurant which offers international as well as Canarian cuisine and serves breakfast, lunch and dinner. The Tropicana Bar creates the perfect night with its music and entertainment coupled with alcoholic and non-alcoholic beverages. Guests can also help themselves at the poolside snack bar. At Hotel Blue Sea Interpalace, you can indulge in refreshing yourself in the lagoon styled swimming pool, or simply sunbathe in the loungers placed along the pool, or spend some quality time meditating in the gardens. For those who believe in retail therapy can indulge in it, as the hotel is close to several commercial complexes. Guests of the hotel can also indulge in water sports, which are available at the beach. An animal park and a casino are close by as well. The hotel’s entertainment staff ensures that your evenings are fun filled. 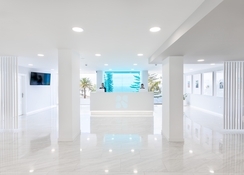 Along with this, the hotel offers car rental, tourist information, 24-hour reception, free Wi-Fi in common areas, laundry service, and vending machines for drinks and food. Perfect hotel and stuff were very helpful. The hotel is in perfect location. Nice hotel friendly staff food spot on would recommend will be going back . Amazing value for money, the staff were fantastic always friendly and made me feel very welcome. I am going back to stay in July I cannot wait!! So for the money I paid I'm pretty happy. Two stars down 1. For the Tour company, as I booked a jet skiing excursion, and due to health and safety reasons (terrible weather where all the other jet skiers where returning, and an old battered jet ski) we wasn't refunded our money. It was clearly a dangerous day and no one else was out. They didn't even try to get my money back. Even half of it..nothing! I would stay clear of Lonten tours. One more star down was for the food. Not great. Not even....good. I couldn't find nothing I liked and I'm not one who's fussy. We booked all inclusive and we hardly ate at the hotel. 2 days beforw we left, we discovered the food at thw opposite hotel (sane company) was much better! Flambe bananas!! Also scary guy near pool side constantly telling people off for putting food in there plates while their shorts where wet. Nice but we ordered a double room got 2 single beds. The hotel was reasonable overall. I stayed halfboard wouldn't want to do that again you were made to feel like a second class citizen! Everything is geared towards all inclusive! The staff were friendly and helpful however!! You get what pay for!!! Food good mybe twice a week !!!! Stayed he 3 times before because tried 2 drffrent one where lot worse !! !